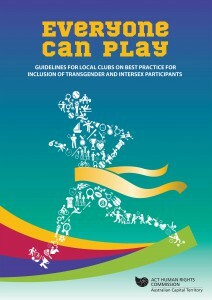 The Human Rights Commission has released a new resource designed to help local clubs be more inclusive, and to increase participation of transgender and intersex players. Research shows that participation in sport is an important contributor to individual well being and that sports benefit from increasing diversity in their participant profile. However, discrimination adversely affects many intersex and transgender people’s enjoyment of sport, and prevents them from participating. “Everyone Can Play” is aimed at supporting local sporting organisations that want to be more inclusive. The resource provides practical guidance, information about legal rights and obligations, and addresses incorrect assumptions that can be made about transgender and intersex participants. The Human Rights Commission worked with the Australian Sports Commission, ACT Sport and Recreation Services and community stakeholders representing transgender and intersex people to develop the guidelines. The Human Rights Commission is keen to support sports at all levels tobuild a safe and inclusive response to everyone wanting to play. You can download a copy of the resource “Everyone_Can_Play” or contact us for a printed copy or accessible version.